Last week we had my in-laws over for a nice Fourth of July feast. It’s been awhile since they have been over for a nice meal, and it was our treat to enjoy a long, lazy, afternoon together. It was also that time of year that every grill on the street was probably getting preheated, ready for an arsenal of vegetables and meat. For me, it was my treat to go straight up classic grilled steaks. I splurged, I’ll admit that, and got some quality cuts of beef from Ray’s Butcher Shoppe in a nearby neighborhood. I’ll admit, I was pretty darn excited to offer up some quality meat to the entire family. I went with filets for my wife and mother-n-law, a great boneless strip for the kids, and some awesome porterhouse steaks for myself and my father-in-law. As I was going to offer up a classic summertime grilled steak affaire, including grilled corn on the cob and a baked potato, I decided twist it up a bit, and offer up the rosemary and garlic smashed potatoes, classic grilled corn, a Vietnamese summer roll for an appetizer, and the famous steakhouse mushrooms to be spooned over the grilled beef. I don’t know about you, but the times we dine at a classic supper club, there are these amazing roasted mushrooms in a great butter sauce that are to die for. So with that said, I wanted to create my own version, and own that I think we all fell in love with. These steakhouse mushrooms go perfect with steak, but hold their own as any side dish to serve. As a matter of fact, I could eat them alone, they are just that good. Add the mushrooms to a large mixing bowl. Add in the oil, garlic, shallots, capers, soy sauce, worchestershire sauce, salt, and pepper. Give a good mix. Toss in the cubed butter. Set aside. Preheat your oven to 425 degrees. Add the mixture to a medium sized casserole dish, and cover with aluminum foil. Place in the preheated oven and cook for about 40 minutes. About 20 minutes in, remove, and give a good stir. Cover, and finish cooking. When these are done cooking, you will notice they shrink is size a bit, and are residing in a pool of deliciousness. Serve over grilled steaks, or heck, place them in a bowl, get a toothpick or two, and dig in. These are also awesome if you have any leftovers to be used in an omelet, or served with a bit of rustic bread. OMG!! I have never been a fan of mushrooms … never! I forced myself to eat them as a child and even as an adult. As a result, I rarely purchase mushrooms. But, a few days ago, I picked up a package of fresh, medium sized mushrooms at a local market. Normally, I would slice them and then sautee the mushrooms with garlic in olive oil, with a sprinkling of fresh parsley, the Italian way. 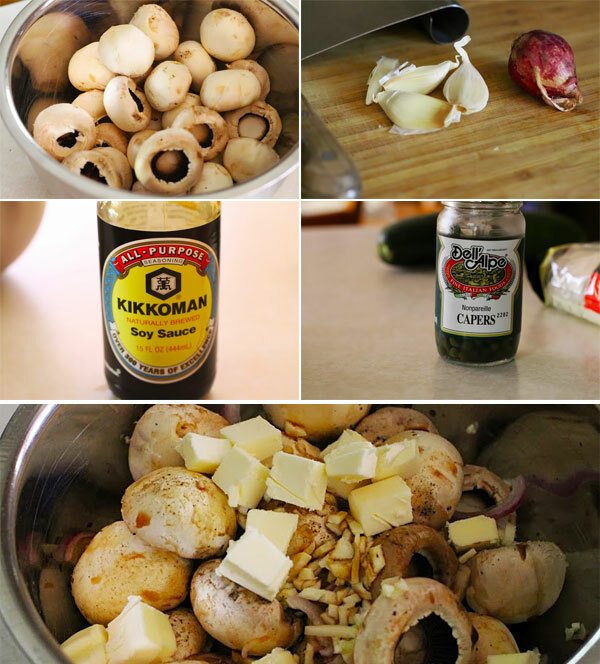 In commenting on your recipe for Colcannon with Kale, I noticed your recipe for Steakhouse Mushrooms. I was planning to grill a steak to serve with the leftover Colcannon and decided to try your mushroom recipe. Amazing!! 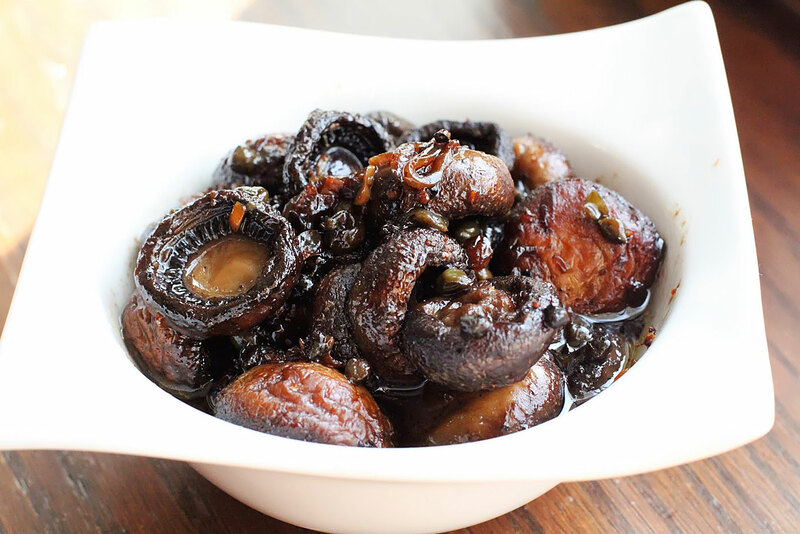 The combination of flavors elevates the mushrooms to tantalizing heights. Your recipe has converted me into a mushroom lover. Thank you! I made these over the weekend – they were awesome! I made this for us tonight and my daughter is vegan so I omitted butter and used all EVOO. They are wonderful. Pinned and planning on making these again very soon. Wow, these were great! While my pan-fried steaks were resting I poured the drippings into my pan and quickly reduced for a delicious sauce.